A scheme which has significantly reduced flood risk to thousands of properties on the West Sussex coast has been awarded a Bronze National Site Award from the Considerate Constructors Scheme. The Shoreham Adur Tidal Walls Scheme, officially opened in March 2019, was presented with the accolade at a ceremony in London on 4 April. The Shoreham scheme was carried out by Mackley, working as part of Team Van Oord and on behalf of the Environment Agency, Coast to Capital Local Enterprise Partnership, Adur District Council and West Sussex County Council. Winning a National Site Award is an exceptional achievement only given to sites that have made the greatest contribution towards improving the image of construction. Construction of the new 7.2km tidal defences in Shoreham began in September 2016, as many of the old defences came to the end of their useful life. More awards’ success on the way? The Shoreham scheme has also been shortlisted for a coveted Construction News Awards, recognising the project team’s success in integrating with the local community. For more than two decades, the Construction News Awards have showcased the very best schemes and companies in the construction industry, and have become one of the most prestigious awards in the sector. Gaining recognition through the awards is considered a badge of excellence among clients and peers. 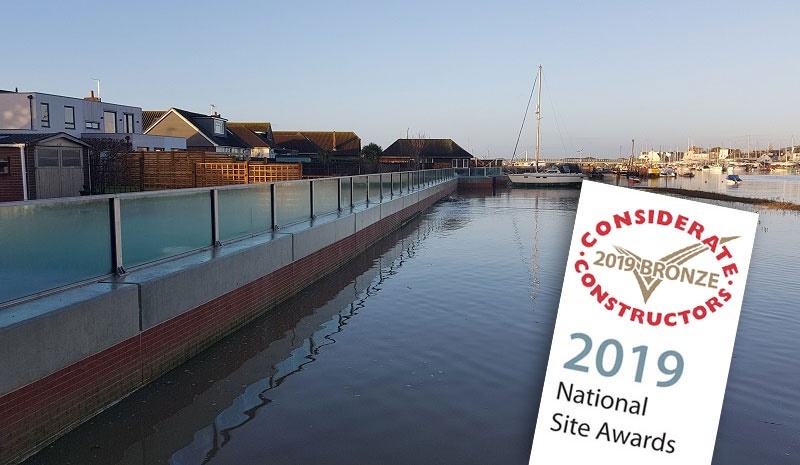 The Shoreham scheme has been nominated in the ‘Community Engagement’ category, where it is competing against projects carried out by other civil engineering companies including Kier and Balfour Beatty. The 2019 Construction News Awards ceremony takes place at Grosvenor House Hotel in London on 11 July.